In this post, you’ll find some thrifty ideas for decorating with old wooden shutters. Woohoo! 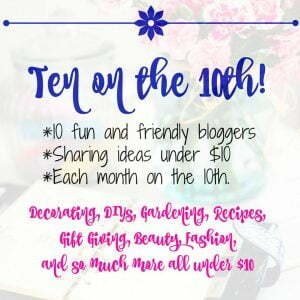 The weekend is here, and it’s the 10th of the month! 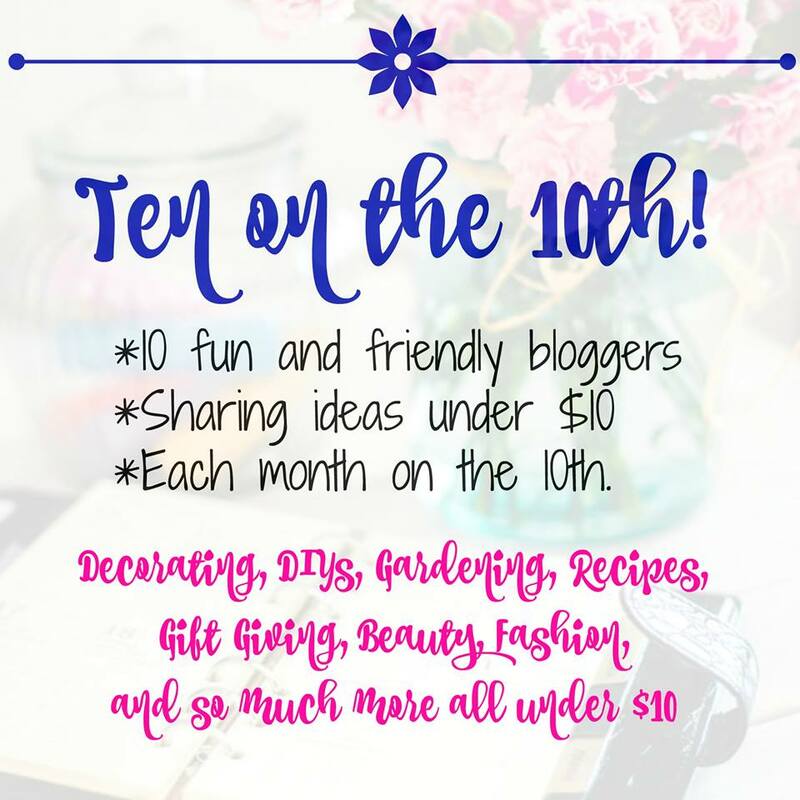 That means that ten of my friends and I are sharing our favorite finds that cost $10 or less. The challenge this month was to share our favorite thrifty item, either old or new, that we use to decorate our home. I’m sharing some ideas on decorating with old wooden shutters. Back in 2014, I found some old wooden shutters in a Habitat Restore in Columbia, SC. I remember getting two pair for $5, and many times I wish I’d gotten all that they had. Back in the 70s, I had these types of shutters on almost all the windows and even used some to camouflage a cabinet which housed the tv. I loved those shutters at the time and still do. When Leo and I moved to the Crossroads, I looked at ordering these same wooden shutters for the window in our bathroom from Lowes. You wouldn’t believe how much they cost new today! Needless to say, I didn’t order them at their outrageous price. My idea back in 2014 was to use the shutters beside the tv that is mounted on the wall above our fireplace. So I spray painted them green and they were used for several seasons until one fell off the mantel and broke into several pieces. The remaining green one was used to make a hanging herb garden. 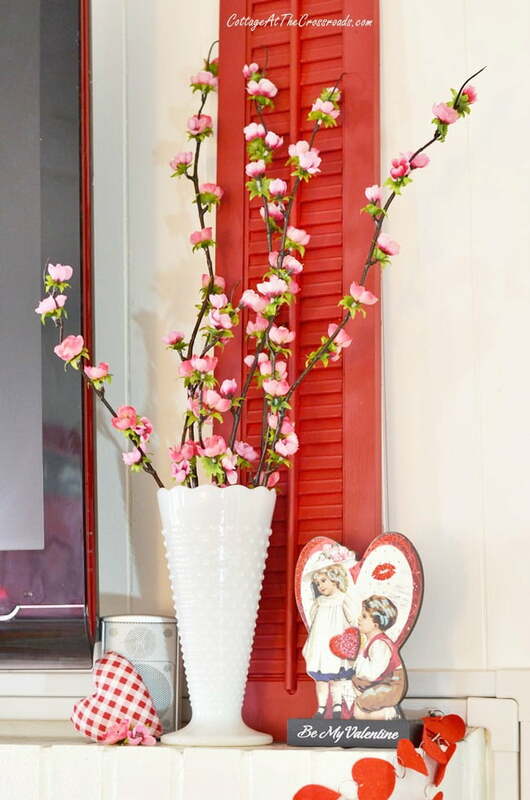 Since I had another pair of the old wooden shutters, I painted them red in order to use them in decorating for Valentine’s Day one year. You see, whenever I take the shutters off the mantel, it looks so bare! So for the past several years, I have been decorating with old wooden shutters for every season. The shutters remained red for about a year or so until I decided to start incorporating more blue into our living area. Then I painted the shutters blue over the red. Here is a closeup so you can see how I painted blue over the red and then sanded the shutters to distress them. It’s an easy way to age them a bit if you can’t find some vintage shutters with chippy old paint on them. You could also use some special paint to crackle them or produce some chipping. The blue shutters were used on our Christmas mantel in 2016 and stayed up all of last year. And Christmas rolled around and I decorated around the blue wooden shutters once again. 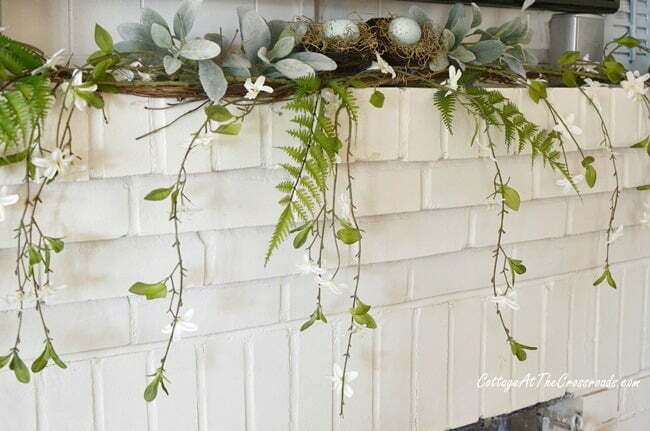 And now I’m putting the finishing touches on our early spring mantel and guess what? 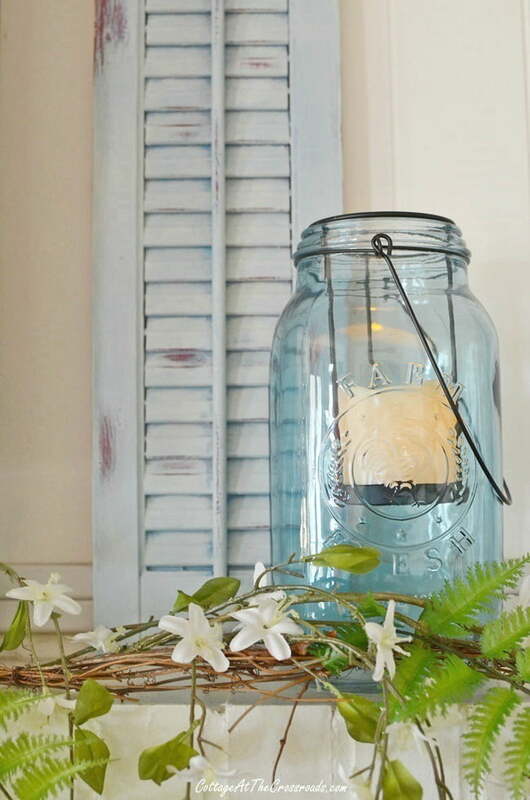 Those blue shutters aren’t going anywhere (and neither are the large blue Mason jars!) I’m decorating around them again this spring. Talk about getting your money’s worth! Remember I said that I only paid $5 for 2 pair. I cannot think of a more thrifty home decor item in our home that has passed the longevity test! So if you see some old wooden shutters at a thrift store, a garage sale, auction, or a Habitat Restore, grab them! If you do a search on Pinterest, you can find the most clever ideas for decorating with old wooden shutters! But I really love mine on our mantel! Now it’s time to see the thrifty home decor items that the other ladies are sharing today. I love these and have been on the hunt for some! Thanks for sharing! Wow, you really scored! I have been looking for shutters for years. In my neck of the woods they are ridiculously priced. I am always scanning the curb just in case. 😉 I love what you have done with yours. Now I just want some even more!! I had some old shutters that were kinda big and we had them on our back patio. I think when we moved the hubby tossed them and I have been very aggravated with him! Now I am even more aggravated with him! 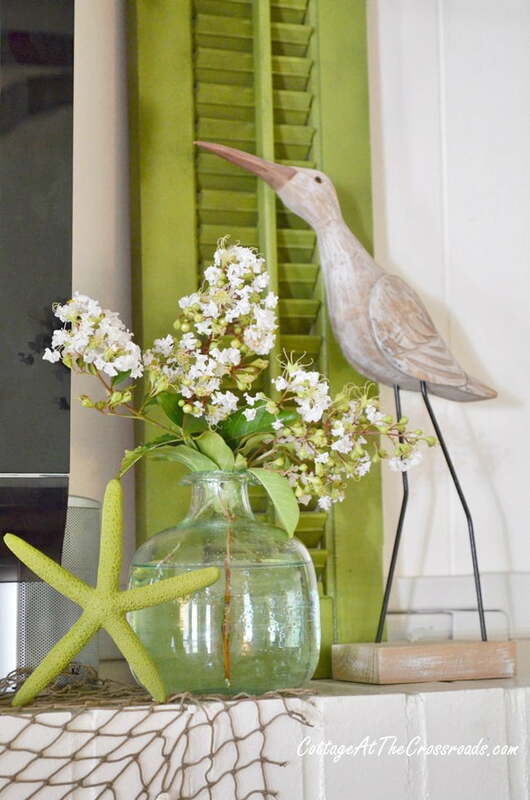 Love your creative design and the way you added them to your darling Spring Vignette! Your shutters add such pretty color and dimension. I got some a few years ago from an old house my dad was redoing. I didn’t want to repaint them so I got rid of them. Now I’m kicking myself! I love the way they add height to a vignette. Great ideas! 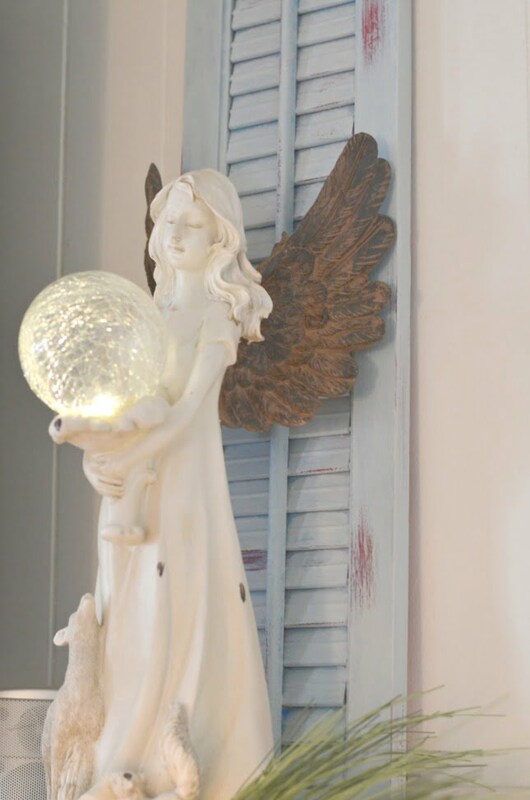 I love those beautiful blue shutters and happy to see them remain on your mantel….looking forward to the new Mantelscaple!! Jane those shutters are real workhorses. They add so much more interest to a room and look gorgeous no matter what color you paint them. I really liked the pop of green you had originally but the blue is also very pretty and calming. I bet if you had more you’d put them in all the rooms of your home. Adorable. I love old shutters. Me, too! I’m thinking about creating a gallery in the hallway and using some there. I have to use an enormous amount of restraint to avoid purchasing every set of shutters I find. They are so versatile to use as decor. I adore all your ideas. Thank you, Lisa. 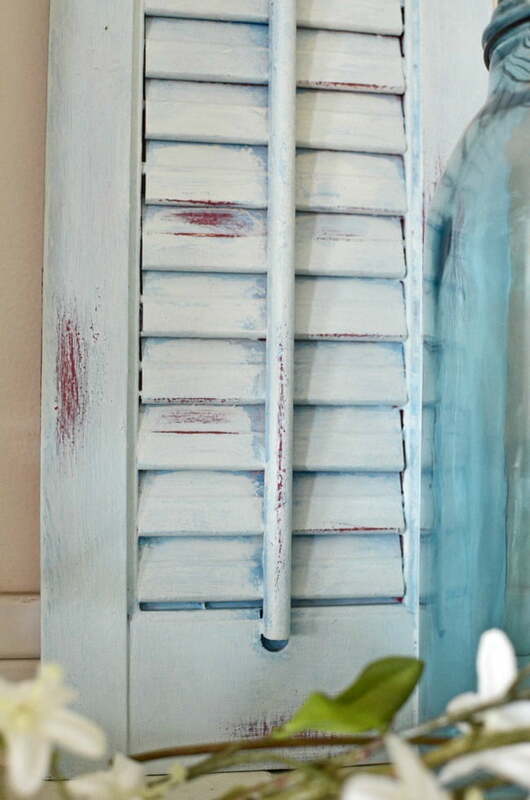 When I find some more vintage shutters, I’m going to put them up in my bathroom! I really like your shutters! 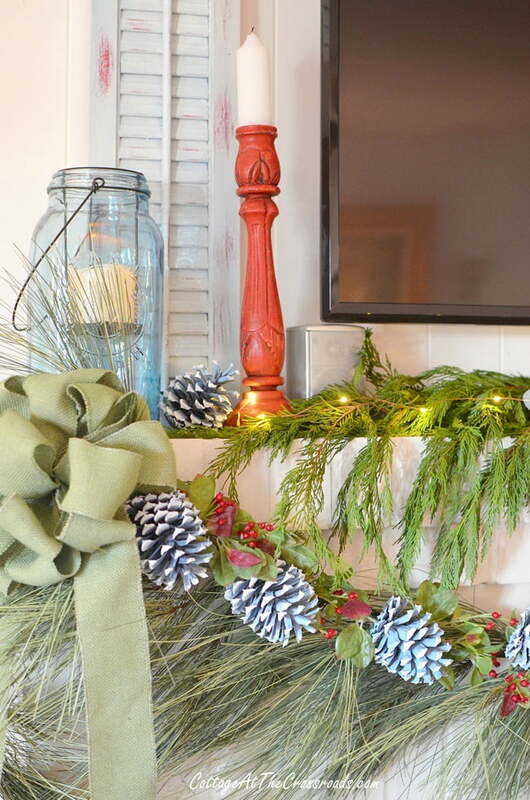 Your shutters are a great idea for decorating around a t.v. on a mantel. I just love the ones you painted red for your Valentine’s decor. Thanks for the inspiration! When I find some more shutters, I may have to paint some red again! What a clever idea to add some texture to a vignette! I am partial to the red shutter, but like how you let some red shine thru when you repainted! Your spring mantle has given me an idea – I struggle with my mantle constantly! Do you have a tv above it? I struggled with how to decorate around one until I added the shutters. 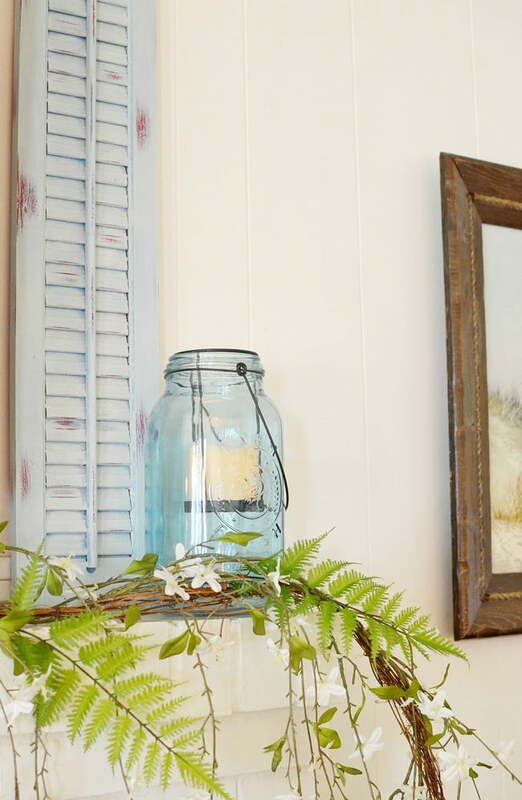 I love those blue shutters and your spring mantel! 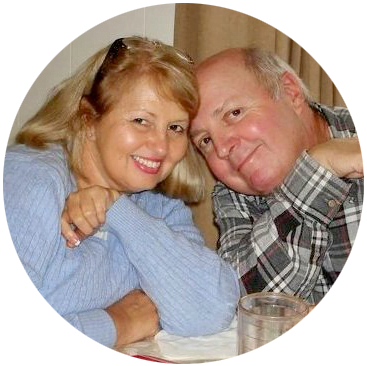 I know I have some shutters somewhere…. after seeing yours I must find them! Yours are so pretty, you have inspired me. Thanks so much, Tammy! Shutters are so versatile and can be used in so many ways.